I’m the Smoothie pig – official! Hello there! I’ve got a lovely new thing that Mummy gives me twice a day. It’s a smoothie! It’s really yummy. I was feeling a bit off colour, and although I had nice food to eat I didn’t want a lot of it. Mummy was worried I was losing weight so she got this special smoothie for me from Dr Louise. It’s called Emeraid, and it’s for sick and recovering guinea pigs (and other herbivores). I’m not really sick or recovering, but I’m getting old and I get a bit fed up with things every now and then. Mummy mixes this up and gives me 3 or 4 tubefuls twice a day. It’s delicious. Apart from that there’s not much news. 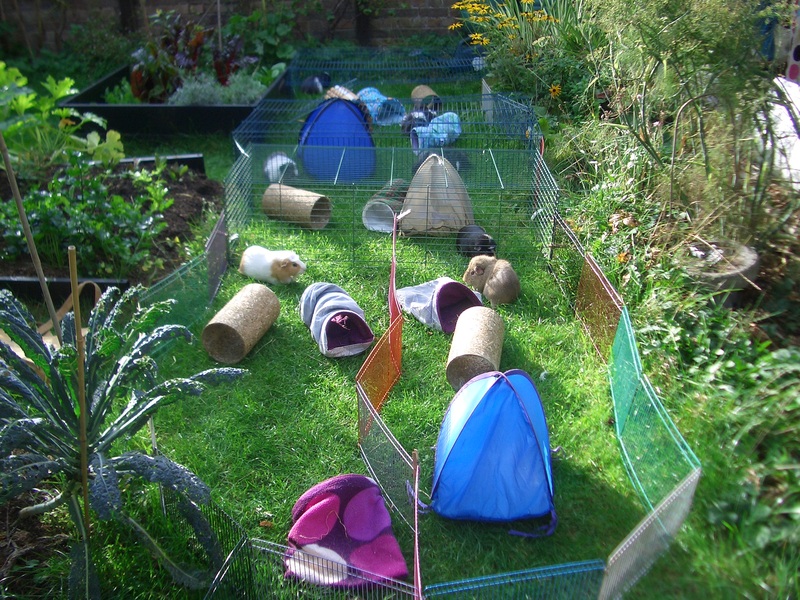 The weather has turned wet and windy and cool, so we won’t be going out in the garden any more this year. We had a nice run on Monday when it was lovely and warm. Here we are in the garden together. I think Colman has already put this on our Facebook page. You can see me on the left in the mid-distance. 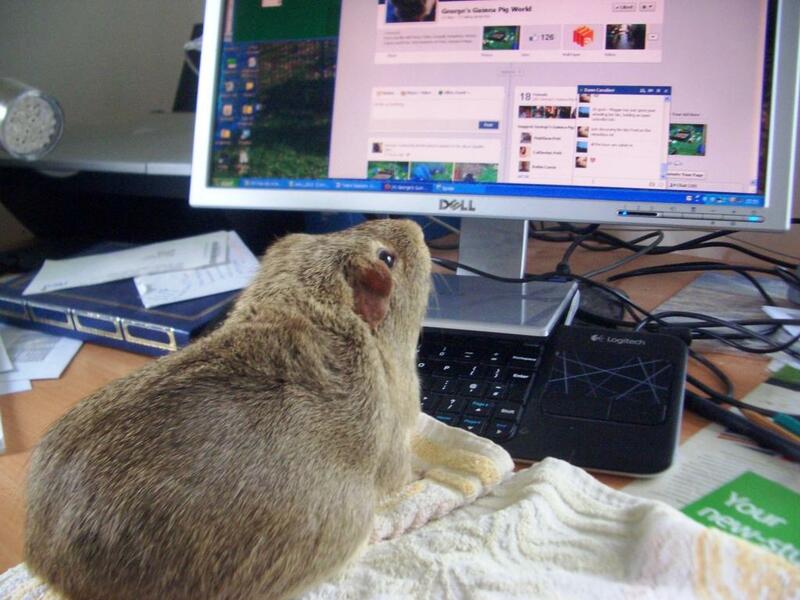 Colman’s been very busy lately, looking after our Facebook page and posing for the Rodents with Attitude forum. He tied for first place with his “Social Network” photograph and got a nice green rosette. George got a nice green rosette once, too. I got a nice blue one once, which Hugo chewed. Ah, Hugo…. That’s it for now. I think I need a nap. You're a smoothie, all right—suave and smoochable and utterly adorable. I know how you feel: I'm getting old and fed up with things, too. I'm glad you're enjoying your smoothies, though. Stay well, Muffin. Wow! What a great garden area you have to play in. You have one very special mum! It is beautiful. I adore the picture of Colman looking after the Facebook page.